Interested in one of our pets -Please- come to our location. Read more about Interested in one of our pets -Please- come to our location. Help wanted ~ Apply in Person Please. 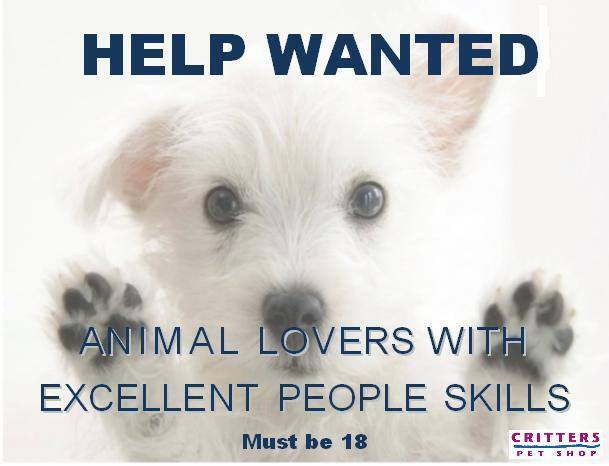 Read more about Help wanted ~ Apply in Person Please. Adopting a new puppy can be an exciting event for any family, but it is work. Read more about Adopting a Puppy. Please remember that the majority of your rabbit's diet should consist of hay. Note: Fresh fruits and veggies can trigger diarrhea in young bunnies therefore our bunny breeder does not recommend fresh produce until 6 months of age. She recommends lots of Timothy Hay every day with fresh rabbit pellets.